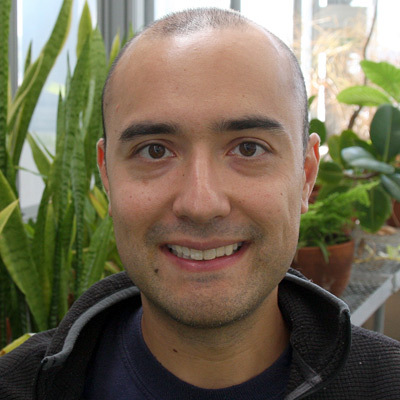 I’m a plant evolutionary ecologist with special interests in pollination biology and plant-herbivore interactions. I also am interested in how insect phenology is affected by climate change. I am a big fan of field work and have study sites in Ohio, Arizona, and California. During the Ohio winters, I use manipulative experiments in the greenhouse to answer some of my questions (especially # 2 below). I am broadly interested in the interactions among plants and their environment and visitors. In particular, I investigate how mutualisms such as plant-pollinator systems can withstand interruptions by other insects. I do this in two main study systems, with opportunities to work both in the greenhouse and in field conditions. The first system is based on the plant Sacred Datura, which grows in the Sonoran Desert in Arizona. Both native beetles and introduced honeybees visit the plant, perhaps disrupting the action of the plant´s presumed major pollinator, a large hawkmoth. We are doing a series of experiments to see if these disruptions affect plant growth and fitness. My second system involves mostly work in the greenhouse during the school year. We are trying to understand why some insects like to eat different colored petals versus others and whether this corresponds to what we see in the field. For these experiment we use introduced populations of wild radish in California. Does variability in herbivore pressure over time affect the evolution of induced resistance in wild radish? How and why do florivores (things that eat flowers) choose what flowers to eat? How does florivory affect pollination and fitness in sacred Datura, Datura wrightii, in Arizona? What factors are affecting butterfly species richness and diversity in Northern California? Eliyahu, D., A. McCall, M. Lauck, A.Trakhtenbrot. 2015. Florivory vs. nectar robbing perforations in flowers of pointleaf manzanita Arctostaphylos pungens (Ericaceae) and their effects on plant reproductive success. Arthropod-Plant Ineractions, in press. McCall, A.C., and D.E. Carr. 2013. Does inbreeding affect tolerance to inflorescence damage in Mimulus guttatus? The Open Ecology Journal 6: 1-6. McCall, A.C., S.J. Murphy*, C. Venner*, and M. Brown*. 2013. Florivores prefer white over pink petal color morphs in wild radish, Raphanus sativus. Oecologia 172: 189-195. McCall, A.C., and C. M. Barr. 2012. Why do florivores prefer hermaphrodites over females in Nemophila menziesii (Boraginaceae)? Oecologia 170:147-157. Forister, M.L., J.A. Fordyce, A.C. McCall, and A.M. Shapiro. 2011. Silvery blues: they came and went, a complete history of colonization and extinction. Journal of Insect Science 11: article 130. McCall, A.C., J.A. Fordyce. 2010. Can optimal defense theory be used to predict the distribution of plant chemical defenses? Journal of Ecology 98: 985-992. McCall, A.C. 2010. Does dose-dependent petal damage affect pollen limitation in a California annual plant? Botany 88: 601-606. Forister, M.L., A.C. McCall, N. J. Sanders, J. A. Fordyce, J.H. Thorne, J. O’Brien, D.P. Waetjen, and A.M. Shapiro. 2010. Thirty years of climate change and habitat alteration shift patterns of butterfly diversity. Proceedings of the National Academies of Science, USA 107: 2088-2092. McCall, A.C. 2008. Florivory affects pollinator visitation and female fitness in Nemophila menziesii. Oecologia 155: 729-737. Colin Venner, 2009, Thesis: “How does pollinator activity affect fitness in Echinacea angustifolia? Entomology, literature, and design are fed by imagination in this cross-disciplinary student project.